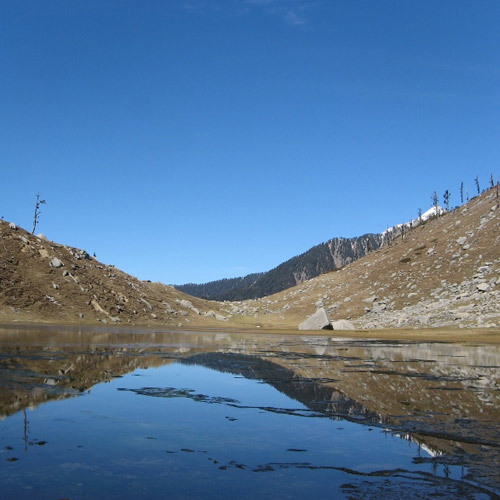 The Kareri Lake trek is a moderately easy 4-day trek in the Dhauladhar range. The lake has a calm vibe and quiet environs, and is shallow around the banks, although the water is cold. Most of the trail is easy, but there are some rocky outcrops and steep uphill climbs, so it is recommended for fit beginners and experienced trekkers. 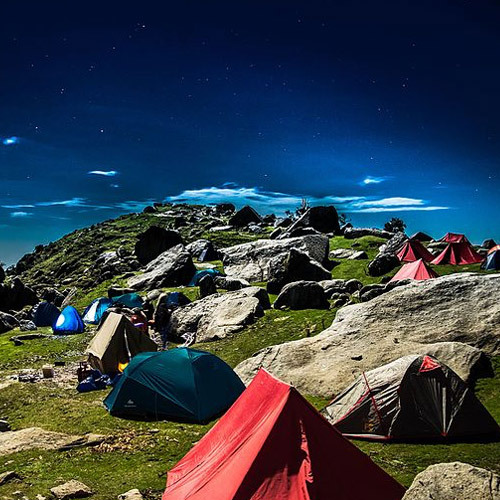 For the Kareri Lake trek, you’ll start from McLeodganj and wind your way up to Riyoti, your first camp for the night. The next day, you’ll trek to Kareri village, and camp nearby for the night. On Day 3, you’ll trek to the lake and spend the rest of your day there. It’s a great chance for photography, and you’ll be able to watch the sun setting over the mountains. 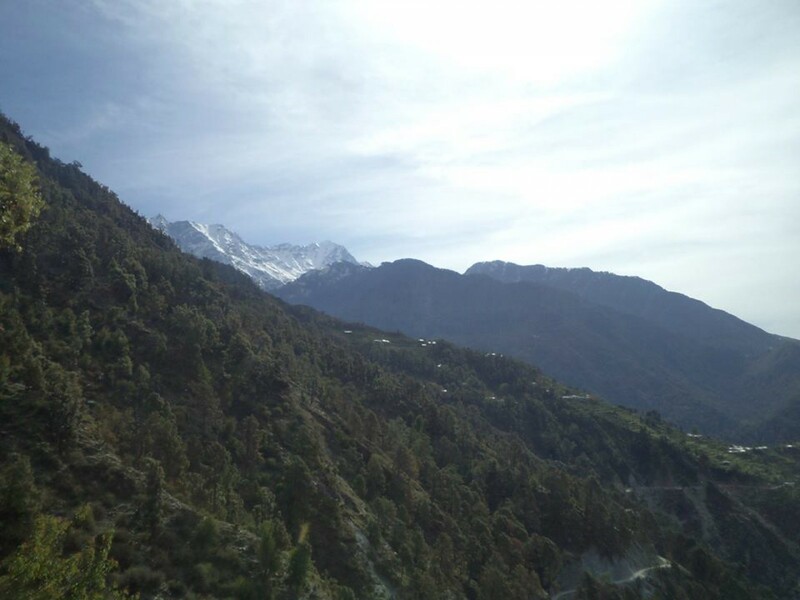 From there, you’ll retrace your steps and trek back to McLeodganj. If you like trekking, you should check out our list of Short Treks in Himachal Pradesh. Extend your Kareri Lake trek to include a fun climb to Minkiani Pass. 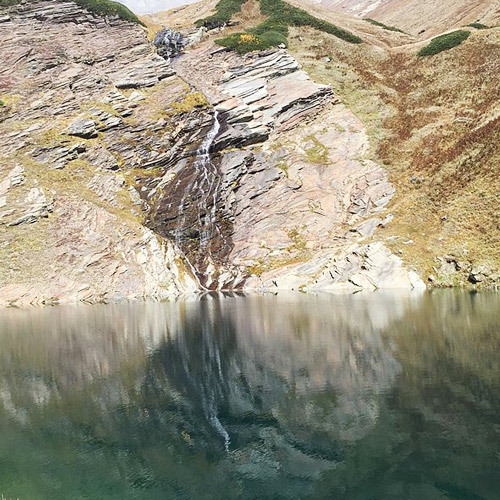 You’ll trek to the lake as per the itinerary, and then go beyond to Minkiani Pass. Apart from that, as you’re starting at McLeodganj, you can also cover Triund and Indrahar Pass before or after Kareri Lake. This extended itinerary takes you to the alpine meadows of Triund from where you’ll be able to see the magnificent spread of the Dhauladhar range and to the high-altitude Indrahar Pass. While this trek will challenge your endurance, it will also give you a real mountain experience. You start your trek to Kareri Lake through rhododendron and pine forests, crossing bubbling streams and wooden bridges. As you ascend higher, you’ll find yourself in the middle of alpine meadows and oak forests. The path will get steeper here, and you’ll have to work a bit harder to climb. You’ll camp close to gurgling streams, under starry skies. When you’re closer to the lake, the views open up, and you’ll see the Dhauladhar range all around. At the end of your Kareri Lake trek, the lake is your reward. Your campsite will be set up close to the lake from where you will get stunning views of the Minkiani Pass. The summer is a good time to escape the heat and head for the Kareri Lake trek. Between May and July, the temperature remains between 8-20 degrees Celsius. You will trek through lush green meadows and rhododendron forests, and the lake is full. 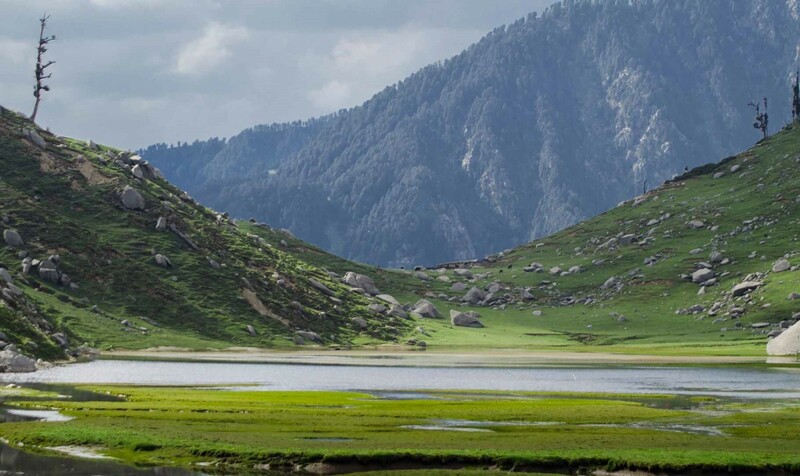 This makes the Kareri Lake trek a perfect summer adventure. It is also one of the top winter treks in Himachal Pradesh. The lake is usually frozen over during the winter months, and the snow lies thick on the trails. 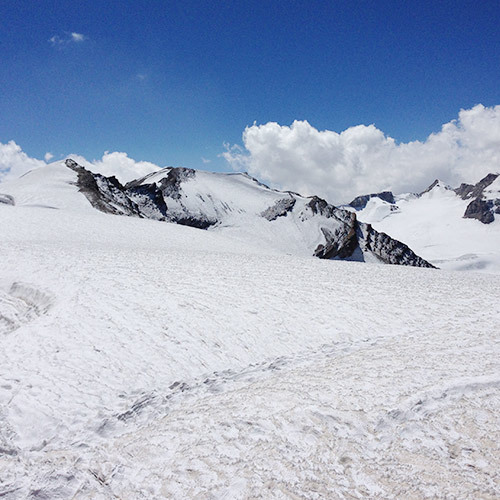 The trek becomes harder in the winter, and the temperature can drop to 2-3 degrees Celsius, or lower. This 3-day trek to the Kareri Lake will take you through the mountain peaks of Dhauladhar Mountain Ranges. You will trek through forests of oak, pine and rhododendron, hike along the Nyund River and camp in some of the most scenic locations in Himachal Pradesh. Open your eyes to the exhilarating beauty that nature holds and trek from one gorgeous landscape to another. At altitudes as high as 9,600 ft, you will spend the evening around a crackling bonfire with the rest of the travellers. You will end your days in tents pitched under the starry Himalayan night sky and drift into a restful night’s sleep. 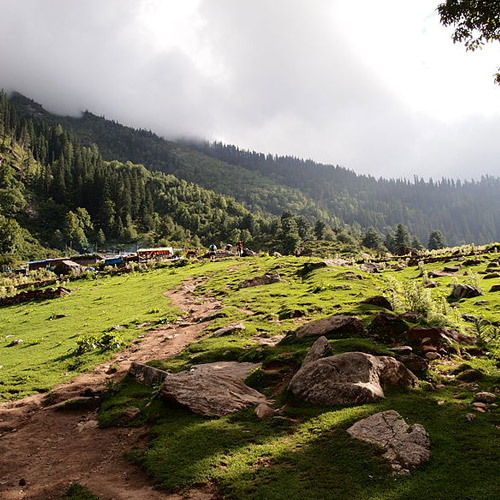 This exciting 4-day trek to Kareri Lake begins at the town of McLeod Ganj. Hiking over mountain trails, you'll trek alongside the Niyund river stream and camp at the villages of Rioti and Kareri before arriving at the Kareri Lake. En route, you'll catch riveting views of the Dhauladar mountain ranges. Upon reaching Kareri Lake, you'll also visit the temple of Lord Shiva, located on a hilltop overlooking the still waters of the lake. Since this trek takes you over relatively easy terrain with patches of strenuous climbs, it is ideal for fit beginners as well as experienced trekkers. 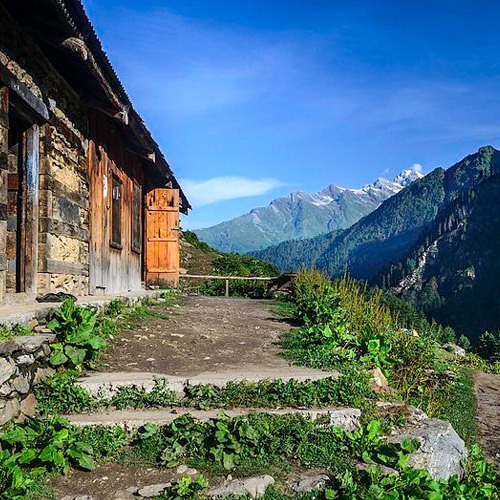 This exciting 3-day trek to Kareri Lake begins at the quaint Kareri village. 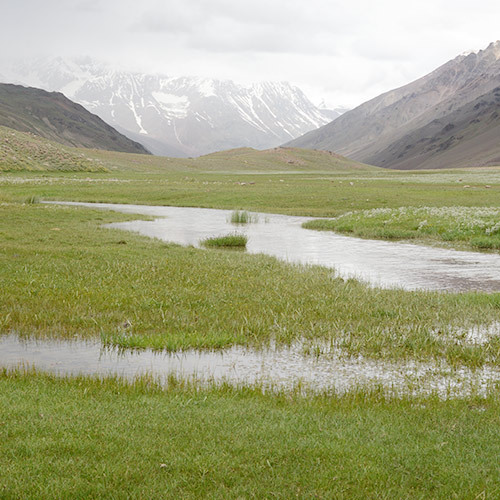 Trekking alongside the Niyund stream, you'll catch riveting views of the Dhauladar mountain ranges. Upon reaching Kareri Lake, you'll also visit the temple of Lord Shiva, located on a hilltop overlooking the still waters of the lake. IMPORTANT: Please note that a minimum of 2 travellers are required to book this trek. Imagine this: You're walking down a trail in the middle of the Dhauladhar mountains, the wind blowing gently over the wide open spaces. You've just walked through forests scented of pine and filled with blossoming rhododenron, but now you're out of the shade, enjoying the sunshine. The air is fresh and the skies are clear. In the distance, you can see a flock of woolly sheep being herded down the green slopes. And then, as you go around a boulder, as if by magic, Kareri Lake appears. It's a clearwater lake, and you can see every pebble at the bottom, and the reflection of the skies above. You take off your trekking boots, lay your backpack down on the ground, peel your socks off, and step into the cold water at the edge of the lake. It's paradise. And you're in the middle of it. IMPORTANT: This Kareri Lake trek is not a fixed departure trip, so you will need a minimum of 4 persons to book it. The Kareri Lake trek is a perfect trek for anyone who is seeking natural enrichment in a short span of time. For a blissful 3 days, you will be amidst dense forests, grazing sheep, snowy peaked mountains, lush valleys, clear blue skies, fresh air and of course the lake itself! 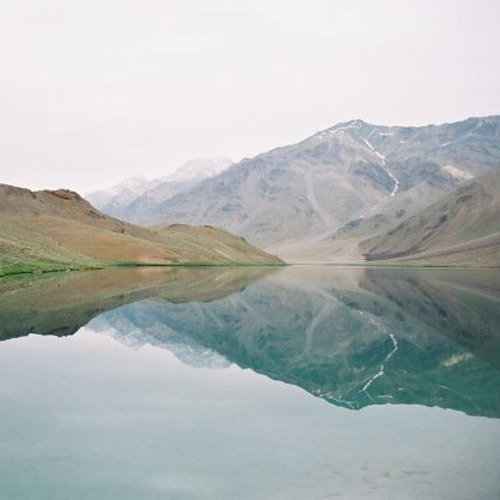 The lake is fed by melting snow from the Dhauladhar range around, and is pristine and shallow. There are great opportunities for photographers here, thanks to the reflections in the clear water. IMPORTANT: This is not a fixed departure trek and requires a minimum of 2 travellers to book. Can beginners do the Kareri Lake trek? 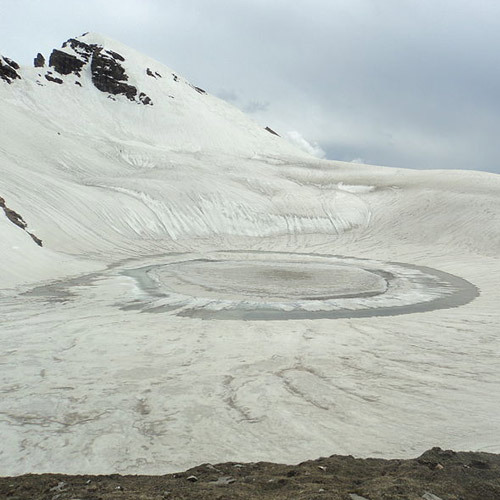 Fit beginners can do the Kareri Lake trek in summer. In the winter, when snow covers the trails, the trek will become harder, so it is not recommended for first-timers. If you’re looking for summer treks, you should check out our blog, Top Summer Treks in India. What is the best time to go for the Kareri Lake trek? The summer is a good time to go for the Kareri Lake trek. The trail is green and lush, and the lake is full. However, in the winter, it is a very beautiful trek with snow on the trail and all around. You’ll also get to see the lake in semi-frozen form. However, it can be very cold during the nights – as low as 2 or 3 degrees Celsius. What should I pack for Kareri Lake trekking adventure? For the Kareri Lake trek, you must carry layers, depending upon the season. While even the summer months will require warm layers and light sweaters, the chilly winters demand thermal liners and fleece jackets. Your day-to-day outfit will consist of synthetic track pants, full sleeves T-shirts and a pair of sturdy trekking shoes. You will need a windproof jacket, woolen gloves and socks and a balaclava to keep your ears covered. While these will keep you warm and covered, don’t forget to pack your daily essentials. You must keep a water bottle, light snacks, raincoat, torch and wet wipes always handy.